18.04.2019 - Converse Bank has finalized the results of the Spring Holidays contest. The Bank had proposed its Woman’s cardholders to make noncash transactions from March 8 to April 7, collect Spring points and win an 8-day trip for 2 to Sri Lanka. 08.04.2019 - AGBU Armenia, together with Fruitful Armenia Charity Foundation, is taking its Women Entrepreneurs project to women in Artsakh. The project, implemented in the framework of the AGBU Women Empowerment program launched in Armenia in 2017, looks to boost women’s entrepreneurial skills and teach them how to apply those in the world of business. 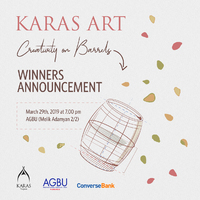 01.04.2019 - Karas Wines and Converse Bank companies, managed by Argentine businessman of Armenian origin, philanthropist Eduardo Eurnekian, summarized the results of the contest announced for Armenian artists. The contest was conducted within the framework of Karas Art program with Converse Bank’s financial support. 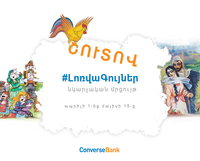 29.03.2019 - Converse Bank is starting a number of contests devoted to the great Armenians, whose jubilees are celebrated this year. This is another cultural initiative by Converse Bank aimed at increasing awareness of the cultural heritage left over by the great Armenian writers and raising interest towards their works. 20.03.2019 - In case of making purchases with ConverseBank’s Mastercard plastic cards, cardholders will not only get the opportunity to participate in the lottery for a journey to Walt Disney Studio Park organized by Mastercard payment system, but also to make use of the Bank’s profitable offer to accumulate Converse points and exchange them for gifts in the Bank’s partner network. 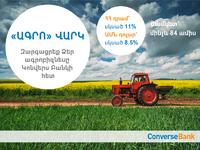 13.03.2019 - Towards the agricultural season, Converse Bank has launched a new loan type "Agro" offering affordable and competitive interest rates to start-up and growing agricultural businesses.